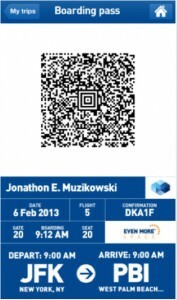 Just over one year after the launch of its mobile app for iPhone JetBlue Airways has upped the functionality significantly, enabling mobile boarding passes for passengers. The latest version of the app was released in the iTunes store today with many updates; the mobile boarding pass functionality is, by far, the most significant. It is expected that the Android application will be updated shortly to include similar functionality. The service will start in a limited number of airports with more expected to be added in the coming months. The first airports to participate include all 6 hubs: New York City – JFK, Boston, Orlando, Fort Lauderdale, San Juan, and Long Beach. In addition, San Francisco and Las Vegas are participating. Some of the other features added are also quite useful for customers. They include booking of TrueBlue award trips directly from the app, terminal maps and better integration of the new TrueBlue Mosaic program. This is a big step forward for JetBlue, adding functionality to its mobile apps that was noticeably absent when they were released. Plus it makes things more convenient for passengers, which is always a win.